Your central air conditioning unit will not last forever. Even though most of these units have a 12-year lifespan, you should expect your unit to fail a couple of times before it becomes obsolete. Hiring a central air conditioning repair expert to run regular maintenance checks on your system will help you address most of the problems before they turn into catastrophes. Below we will discuss what your overall cost to repair central air conditioning could be as well as the various types of repairs and their related costs. When Is It Time For Some Air Conditioning Repair? The air conditioner isn't working at all. The A/C unit runs but it's not producing any cold air. There are odd noises coming from the A/C. A bad smell is emanating from your A/C unit. Short cycling or premature cycle termination. Water is leaking out around the A/C unit. There is ice and frost buildup on your A/C unit. Replacing the fuse or circuit breaker if the compressor doesn’t run. Occasional cleaning (or replacement) of the condenser and filter to increase the unit’s efficiency. Clearing clogged drainpipe in case of water leaks on the furnace. If your troubleshooting doesn’t return any results, you should always call in an expert to handle any central air conditioning repairs. Venturing too deep into the unit could prove catastrophic. Before you hire just anyone, compare multiple estimates to establish a fair cost to repair your central air conditioning. Comparing estimate will ensure that you get quality workmanship and value for your money. How Much Will It Cost To Repair Central Air Conditioning? Central air conditioning repair costs vary depending on your system model and the damages. Some professional repairs can go for as low as $200, but you should expect to spend anywhere between $300 and $900 when calling in a professional. In some cases, depending on the extent of the repairs, this can be as high as $1,600 when replacement parts are required. The actual central air conditioning repair bill will depend on the spare parts and labor fees. Valuing the labor is easier than estimating how much you will spend on spare parts. Most HVAC repair experts will charge per hour or per contract. The rate will vary depending on the task’s complexity, current market demand (most HVAC units breakdown in summer, repairing yours before summer could fetch you a friendlier bill) and individual qualifications. Remember to choose a certified central air conditioning repair contractor as this will prevent voiding your warranty. Spare part prices will vary depending on unit model and size. A small central heating unit might need a $110 capacitor while a bigger unit will run on a $400 capacitor. Although the average American homeowner can expect to spend anything between $300 and $900 for rigorous central air conditioning repair jobs, most will pay an average of $500 to get their HVAC systems running smoothly. Most of the malfunctions and repairs are due to poor maintenance. Giving your central air conditioning an annual service and checkup will help you keep it running optimally and keep the overall cost to repair central air conditioning to a minimum. An optimal system will be less susceptible to failure and general malfunction. These inspections and maintenance passes will address existing problems long before they turn pricey. The price of a new air conditioning installation is a lot more than a repair job. You should always learn to ‘listen’ to your central air conditioning system for telltale breakdown signs. Your air conditioning unit doesn’t turn on at the right time? This could be a faulty thermostat or circuit breaker. Your home's temperature isn’t as comfortable as it used to be? You could be experiencing the effects of a clogged filter. Your utility bill is abnormally high? This suggests that your AC unit is no longer efficient. Call in an expert. Weird startup or operation noises? Could be a faulty or loose fan. Call in an expert. Getting in touch with a local professional is often the only way to address your central air conditioning repair. Most companies will offer you a free estimate on their services, so be sure to compare several in order to establish a fair price in your area. Want to find out what your central air conditioning repair bill could be? We can connect you with registered HVAC experts operating in your local vicinity. All you have to do to get your FREE quote is enter your home zip in the space provided on this page. That's right, you can get a FREE quote on central air conditioning repair with absolutely no obligation to purchase, hire, or sign any contracts. It's also a great way to decide what will be possible should you be working on a budget, so take advantage of this free offer today and get in touch with an HVAC specialist near you. 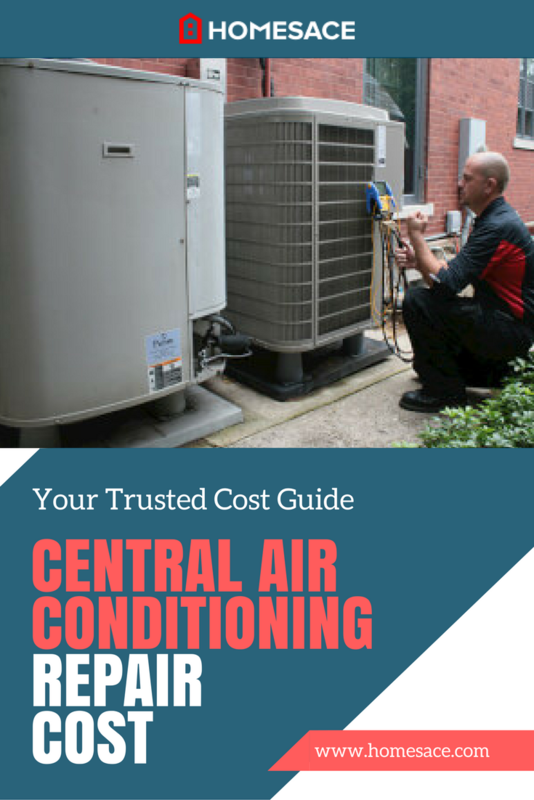 Central air conditioning repair costs vary depending on your system model and the damages. Get in touch with local professionals to get a more accurate idea of what you should be paying.